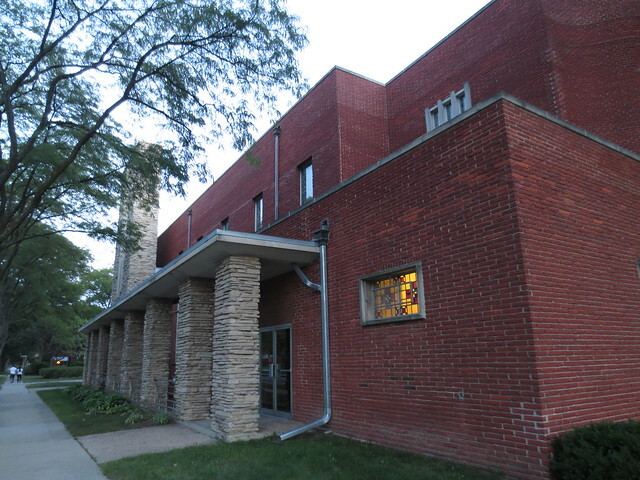 There is plenty of Mid-Century Modern in Skokie, but most of it is not on this level. 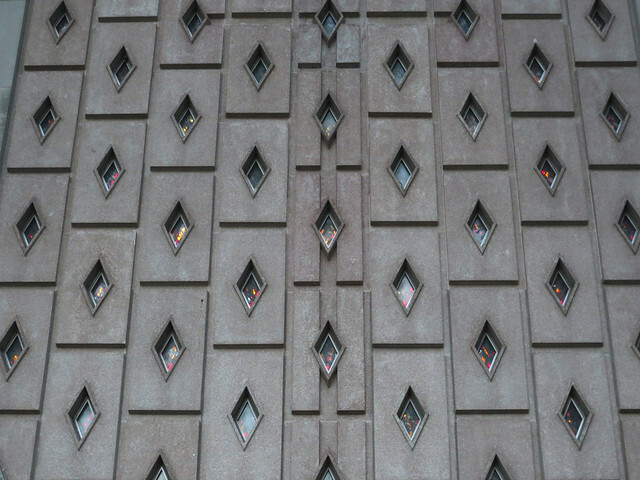 St. Lambert is highly decorated and heavily stylized, inside and out. 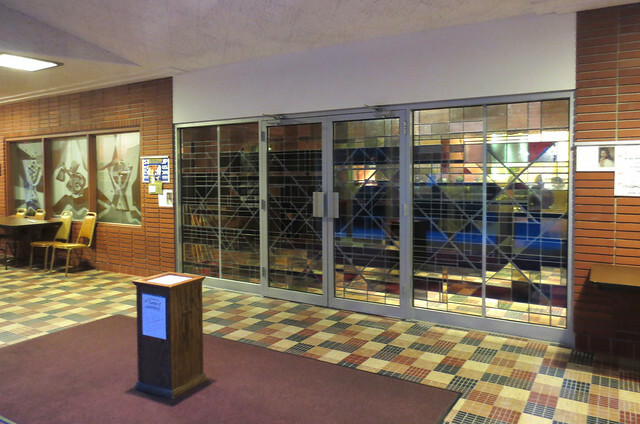 The lobby, for example, has stained glass doors and windows (with patterns unique to this part of the building), walls of red Roman brick, and exuberant patterns of floor tile. 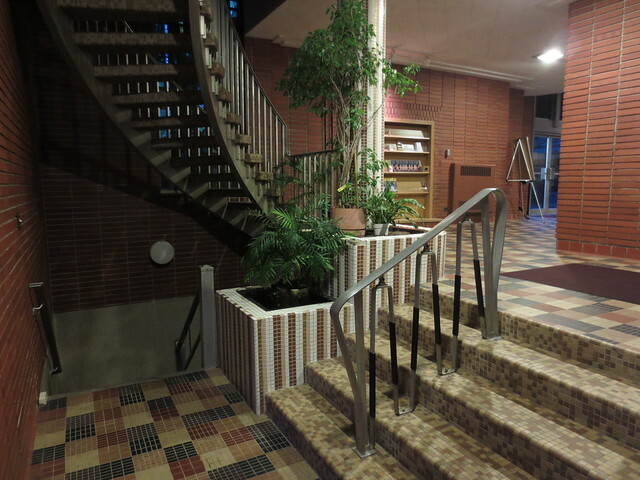 Stylized stainless steel railings and free-floating steps take visitors up and down, while built-in planters bring the indoors into the building. 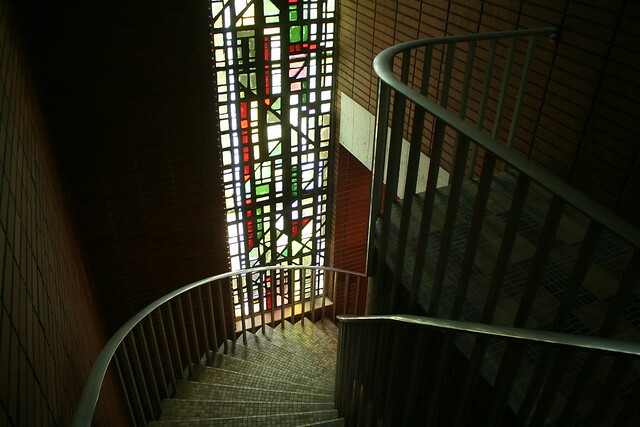 This beautiful textured glass window separates the lobby from the sanctuary. 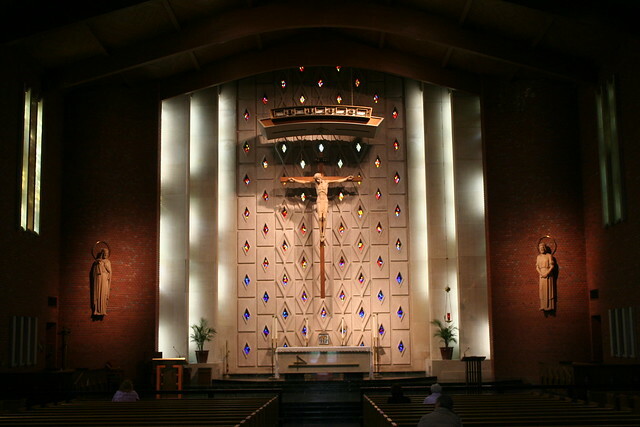 The sanctuary is large and open, with arched wood laminate beams creating a space with no columns. 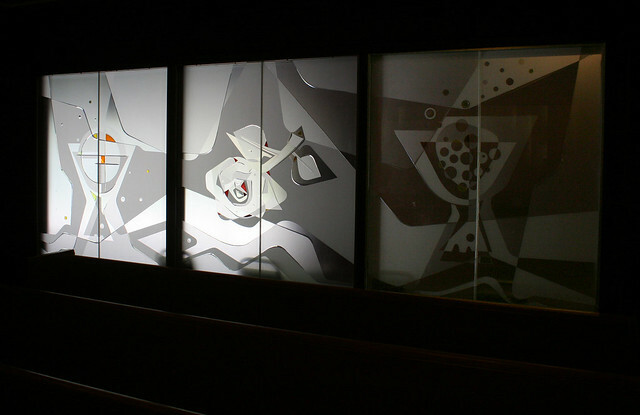 Behind the altar is a striking wall flecked with diamond-shaped windows, infilled with faceted stained glass. St. Lambert Parish was founded in 1951, and work on the building complex began in 1952 with what is now the school building. The cornerstone was laid on November 9. This first building was designed by architects Pirola & Erbach. The school closed in 2003, just shy of its 50th anniversary, due to dropping enrollment. 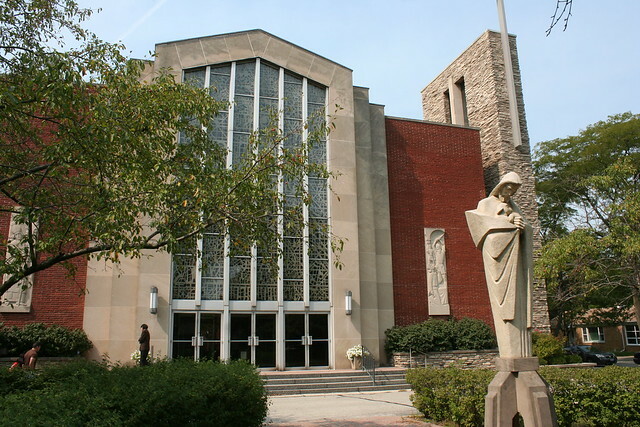 The main church building dates from 1960 and was dedicated in June 1961. Today the congregation has a large Filipino presence. 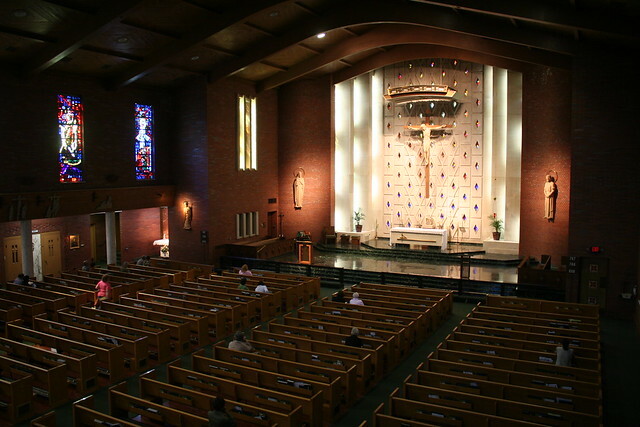 The colors, materials, the grid of geometric windows, and the suburban side street location all give St. Lambert a kinship with Milwaukee’s Holy Family Catholic Church. 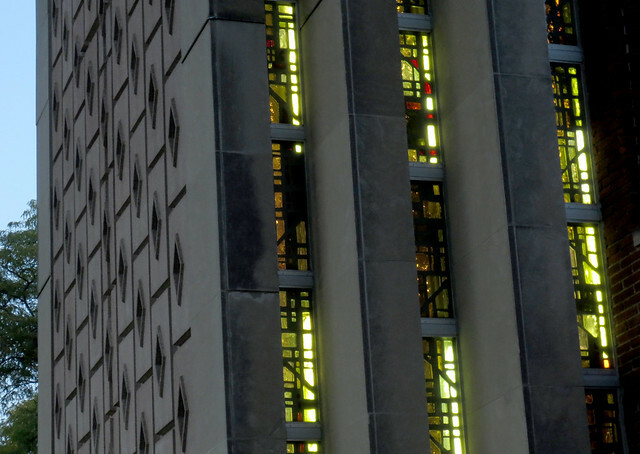 Architect Frank F. Polito (1908-1967) was in practice from the mid-1930s until his death, working from an office on Michigan Avenue until 1938, then from the Mather Tower and finally from Lincolnwood. 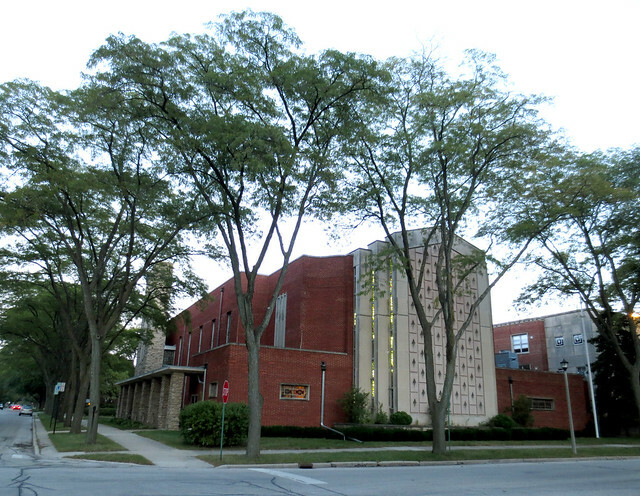 Among his other works are a Moderne 2-flat apartment at Asbury & Isabella in Evanston, several single-family homes in a variety of styles including a dozen on Chilton Lane in Wilmette, the International Style Woodbine School in Cicero, St. Matthew’s Evangelical Lutheran in Niles (done in a style similar to that of Charles Stade), and St. Anne’s Church in Berryville, Arkansas. This entry was posted in Midcentury churches, Skokie. Bookmark the permalink. DO YOU HAVE ANY PHOTOS OF THE OUR LADY OF THE ANGELS SCHOOL FIRE?